A “no pollution” tire factory, funny tour guide, and hard liquor for lunch: the most entertaining factory experience I’ve had in China. 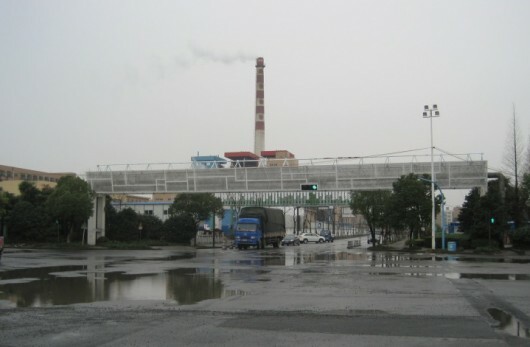 The largest factory I ever visited was an automobile tire-manufacturing complex with more than 10,000 workers. At the time, I was working with a professor on a project to calculate the environmental impact of tire recycling. My colleague – let’s call her Kate – and I were dispatched to take a tour of the complex and see tire manufacturing firsthand. That was the ostensible reason, anyway. The real reason we were there was to schmooze with the plant managers in the hopes of obtaining one of their environmental audit reports. We arrived on a gray-skied morning. We stood at the front gate, by the guard shack, while a steady stream of trucks chaotically navigated in and out of the entrance. All around us were large, gray-walled warehouses. Across the street were more gray-walled warehouses, belonging to other companies located in the economic development area. We were greeted by Mr. Yang, a 30-something business development guy.“So you two are the colleagues of Ms. Xi?” Mr. Yang asked, shaking our hands. Ms. Xi was a colleague of my professor’s who worked at the local environmental protection bureau (EPB) and happened to know Mr. Yang’s boss. Complicated guanxi. It would not bode well for later. 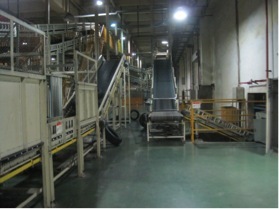 Mr. Yang took us through a maze of hallways and manufacturing facilities. We must have walked for 15 minutes before we arrived in a smoke-infused conference room. Mr. Yang introduced us to the plant manager, Mr. Chang; the head of environmental health and safety, Mr. Bao; and several other high-ups. They were all over the age of 50 and wore the same maroon company uniform. Potentially intimidating, but they seemed like nice guys. “So, what do you two want to know?” Mr. Bao started. “We’re here to learn more about your company and how tires are manufactured,” Kate responded diplomatically. I was trying to pass off as a Chinese grad student by hiding the fact that I was Chinese-American, so I let Kate do most of the talking. Mr. Chang started lecturing us about how tires were manufactured. I realized I had forgotten to bring my pen, so I had no writing utensil to take notes with. I started fidgeting and looking in my backpack while pretending to pay attention. Meanwhile, Mr. Chang and Kate started a heated back and forth concerning the source of the company’s raw materials. What was the blend of natural to synthetic rubber? Mr. Chang was beating around the bush. The moment was tense, and Mr. Chang was saying so much valuable information that was disappearing into thin air all because I had forgotten to bring a pen! I couldn’t take it anymore, so I interrupted the conversation, “不好意思，我能不能借一支笔？ – Sorry, can I borrow a writing utensil? They must not have heard me clearly, because Mr. Chang’s colleague offered me a cigarette. “Sorry, a pencil, not a cigarette,” I said. Great, now I’ve doubly embarrassed myself by not bringing a pen and rejecting a kind-hearted cigarette offer. Mr. Chang and Kate laughed, and the atmosphere loosened. At the end of meeting, thinking that we had warmed everyone up to conversation, Kate asked a question designed to achieve our main purpose of obtaining those environmental reports. Mr. Chang started opening his mouth before Mr. Bao nudged him ever so slightly in the ribs and said, “We don’t have any pollution from our plant.” (Mr. Bao’s nudge was so imperceptible that I didn’t even know he did it until Kate told me about it later). “Nope. Nothing.” Mr. Bao’s tones were short and crisp, emphatic, one might say. And that was the end of the conversation. In retrospect, Kate and I did a bad job in our questioning and failed to realize an important element of the meeting. Namely, that because Mr. Bao and Mr. Chang only knew that we were connected with Ms. Xi of the local EPB, they couldn’t trust that we were here for purely scholarly reasons. They probably thought we were student spies and would report back to the EPB. Mr. Chang then took us on a tour of the manufacturing complex. We saw fancy robotic machines, lots of conveyor belts, and assembly-line workers just like one would imagine in such a large factory. Mr. Chang described it another way, using a strange but effective analogy. Lunch for us was right after the tour. Mr. Chang dropped us off at the company restaurant for white-collared workers, where we met with Mr. Bao and Mr. Yang again. We went into our private room. Mr. Bao ordered an unexpectedly small number of dishes (there would be little waste at our table). Mr. Bao also ordered a small bottle of liquor for himself. It would turn out to be useful later. Kate and I commenced with small talk. We had given up on our mission to obtain the reports and had resigned ourselves to treat the ordeal merely as an experience. Mr. Bao told us the history of the company. It started in the 1950s as a state-owned enterprise. 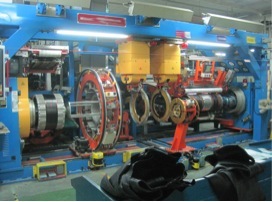 Rubber-based products have been its strength for the past 50 years. It started with five employees manufacturing rain boots, gradually changing to bicycle tires, and now had 30,000 employees in several locations in China. 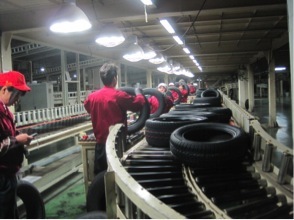 “The company even started competitively selling tires on the international market recently,” Mr. Bao said proudly. Awkward comment. Mr. Bao must have started drinking his liquor already. When the food finished and Mr. Bao had finished his drink, he asked Kate a question. “You’re always welcome to work here.” As head of environmental health and safety, I guess he had some authority to find Kate a job. A short pause. I was containing my laughter. I couldn’t tell whether Kate had responded like that intentionally. Normally, Mr. Bao would have said something deft to change the topic, avoid the pollution question, and save face. But his empty bottle of hard liquor was at work, for he laughed it off. Listening to Mr. Bao, I got the sense that he was a nice person at heart. I didn’t think he or his company was intentionally plotting to destroy society by polluting at all costs. If anything, he felt like his company was adding value to society and providing livelihoods for 35,000 people. However, he definitely lied to us, and I suspect his company doesn’t meet all the EPB standards for emissions. So how can one explain this seeming contradiction? I would have to visit more factories and talk to more factory managers to find out. For now, though, there was a more pressing issue at hand. “So, Mr. Bao, do you have any reports or quantitative data you can let us use for academic purposes to understand your company more?” Kate asked in a last-ditch effort. There was hope that the liquor could change this answer as well. Mr. Bao answered: “不好意思，这些文件是保密的” – Sorry, those documents are company secrets. Alas, mission failure. But a worthwhile experience all the same – and at least we were able to get Mr. Bao to tell a sliver of truth.